This is the first time I tried my hands on Bread Baking. I bookmarked this recipe from Champa's on the day she posted it (June 26th, 2010). I made this couple of weeks ago. Thanks to Champa for this wonderful recipe. I didn't make any changes to her ingredients. Just followed her procedure. The bread came out very well. It was very soft and we enjoyed the homemade fresh and warm bread. 1. First combine water,milk, sugar and yeast together in a large bowl. Keep aside till it becomes frothy. 2. Then, add salt and oil. Mix the contents well. 3. Add the flour little by little while kneading. 4. Knead the dough for 10 to 15 minutes. 5. Coat the dough with little oil and cover with clean towel. 6. After an hour, when the content is doubled in volume, gently deflate and shape it to a loaf in a floured surface. 7. Keep the dough in a greased 9X5 pan. Keep it in a warm place. Cover it loosely with aluminium foil. Keep as such for another one hour. 8. Pre-heat the oven to 375 F.
9. Bake for 20 minutes and then lower the temperature to 325 F and bake for another 15 minutes. 11. You can brush the crust with butter to get the soft crust. Looks great Nithu !!! Baking bread is truly fun. It came out perfect. Bread looks so soft and perfect..I am yet to try my hands on bread making..bookmarking the recipe..thanks for sharing this guys! Fresh homemade bread looks very delicious.Must have tasted out of the world.I hope I would do it some day. Nithu, that is a beautiful loaf of bread that too for first attempt. Keep it going. Once you taste the home made bread, you'll not like the store one. It has been 5 1/2 years since I bought a loaf of bread from the store. Thanks for trying my recipe. You can send it to my bake-off if you wish. I love the taste n wonderful smell of fresh home made bread. This looks soft ,spongy n perfect Nithu..great job!! luks very soft and perfect...Homemade always the best. Oh Yummy! Will be trying this soon. looks like a perfect loaf! wow..perfectly baked bread nithu..looks so soft & spongy. wow ! this is looking like a readymade store bought nithu..turned out perfect ! You made it sound so simple.... I can smell the freshly baked bread already... Thank you for this easy recipe. 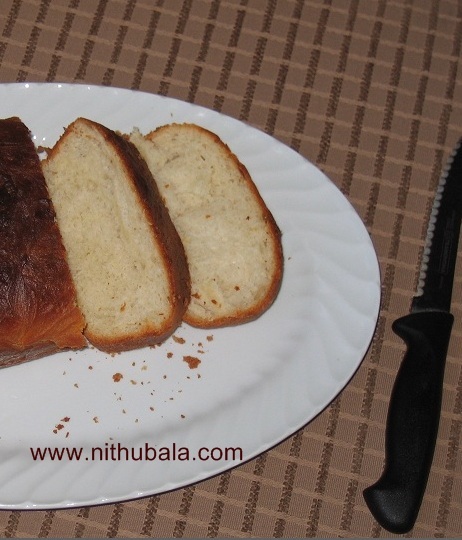 Me too have been thinking to try white bread for a while at home,this looks pretty good nithu! Bread has come out superb....just perfect..
Looks soft and spongy, Its tempting me to bake it now! Looks fabulous ,soft and well risen ! !Just great for a first attempt. looks soft and spongy...perfectly baked!!! Nothing will beat the homemade breads, urs looks prefect.. Wow!! That looks fresh and spongy!!! Perfect and yummy bread!! Great job!! Spongy bread and is very perfect and easy recipe for me as I am just starting to bake in micro. O thanks dear for this wonderful recipe. And your blog is something different and looks special. Love it.